Guy Simser also has good things to say about Rick Black and Turtle Light Press as well as the Turtle Light Press Haiku Chapbook Competition. Many thanks to Guy Simser and Haiku Canada Review for the good review, and to Rick Black for sharing the review with me. 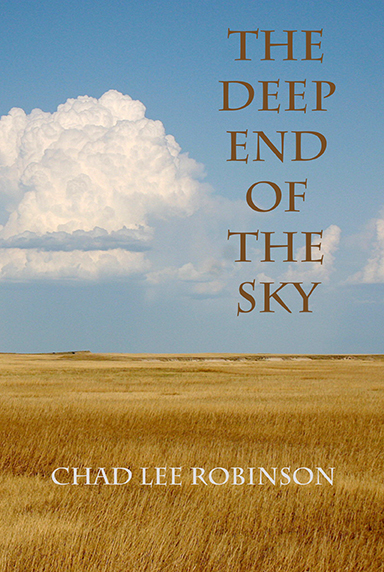 The Deep End of the Sky is now being sold at Prairie Pages, a small bookstore on historic Pierre Street here in Pierre. 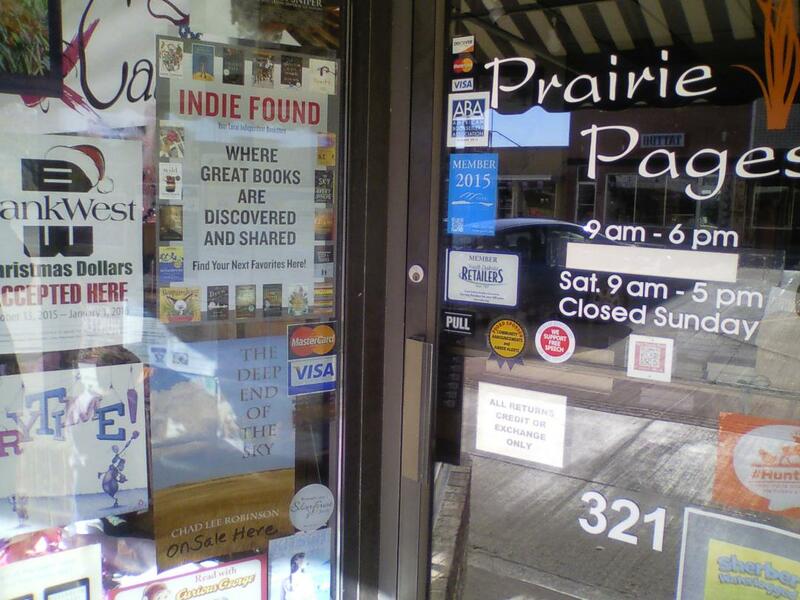 See my poster in the storefront window? So if you happen to be in the area, stop in and buy a copy. 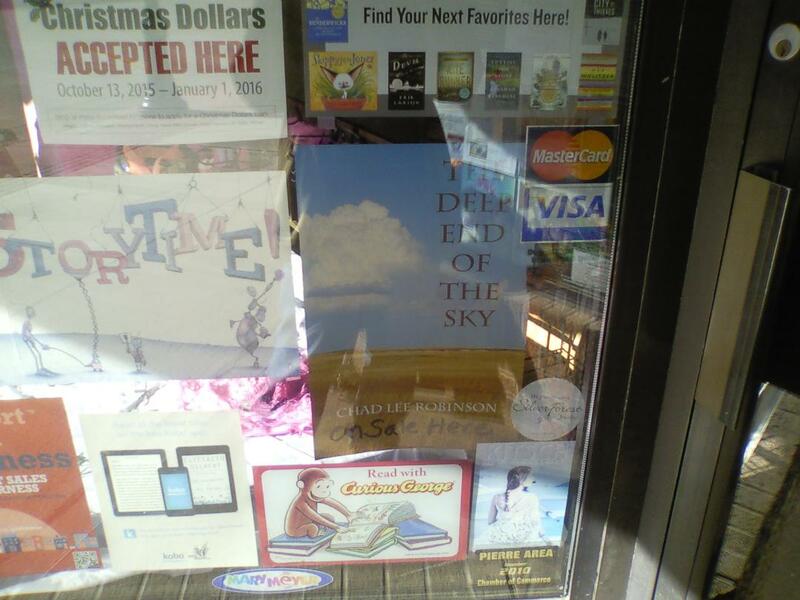 Let’s not forget that The Deep End of the Sky is also sold at Korner Grocery and the Heritage Store at the SD Historical Society Foundation/Cultural Heritage Center (unfortunately the book isn’t for sale in the Historical Society’s online store), both here in Pierre. In addition, you can also buy from Turtle Light Press, Amazon.com (read the great reviews here as well), Book Depository (if you’re overseas), or from me personally (see the books tab above). Thank you to the staff at all locations selling The Deep End of the Sky. I appreciate any help in getting my haiku out into the world. Haiku books make great Christmas gifts. Just sayin’. Rick Black at Turtle Light Press posted questions from an interview with me about haiku on Facebook recently. Since the interview is now concluded he has posted it in its entirety on Turtle Light Press’s blog. So if you missed it on Facebook, go take a look, and if you’re so inclined please check out the books and other items in their shop. I have many of TLP’s haiku books and I can say with certainty that they are all excellent reads. Thank you to Rick Black for conducting the interview and posting each question on Facebook, and to Alan Summers and Tom Clausen for adding some questions at the end. My contest-winning collection of haiku The Deep End of the Sky is still available from Turtle Light Press, in case you’re interested. At $12.50 it’s a steal, and some good reading. My interview with Turtle Light Press started yesterday on Facebook. I hope you’ll follow along as it unfolds . . .
First email in my inbox this morning was from fellow haiku poet John McManus who has selected a haiku of mine to appear in the third issue of Frozen Butterfly due out this fall. This will mark my first appearance in this journal. Frozen Butterfly is the first English-language video haiku journal. Each issue can be viewed on YouTube (I don’t have any work in issue one or two). Since it’s a video journal, that means that readers get to hear many of the poets reading their own haiku, which is always fun and insightful. Many thanks to John for selecting my work! Great news! For those of you who live overseas and are interested in buying a copy of The Deep End of the Sky but don’t want to pay high shipping costs, you now have another option. The book is now available at http://www.bookdepository.com for $12.85 with free delivery worldwide. Did I mention the Book Depository is offering free delivery worldwide? You have no excuse to not buy a copy. Buy it. Then let me know how much you enjoyed it so I can tell you I told you so. You can thank Rick Black at Turtle Light Press for making this happen. I want to share some feedback I’ve received about The Deep End of the Sky, published last month by Turtle Light Press. I’ll share more comments as they come in. The Deep End of the Sky, my contest-winning collection of haiku from Turtle Light Press, has been available for a couple weeks now, and has received much positive feedback from readers. But for those who have not heard about the book or who haven’t yet shelled out their hard-earned cash for a copy, I want to share with you a little something I wrote about each of the four sections of the book including some sample haiku. Here are links to previous posts about each section: The Tractor’s Radio, Rows of Corn, Farm Lights and Home Early. I had the idea for this book back in 2004, and it took me the last ten years to write the haiku that are included in it. I am very proud of The Deep End of the Sky, and am grateful for the opportunity. I don’t think the book could’ve turned out any better. I would be honored if my book found a spot on your shelf. If you’re intrigued, and you think you want to buy a copy, you have three options. You can order from Turtle Light Press. They charge $12.50 per copy with free shipping within the U.S.A. You can also order from Amazon.com for $12.50 per copy plus shipping. Alternatively, you can order directly from me. For $12.50 plus $2.50 shipping, you can have your very own signed copy of The Deep End of the Sky. Questions, comments and orders can be sent to my email: jedirobinson (at) yahoo (dot) com.